Ios Greece is the best party island in the world if you ask me. I have not visited all islands in the world but I have visited the most renowned party islands in the Mediterranean sea, like Ibiza, Kos, Crete, Paros, Naxos, Santorini, Rhodes. The party island of Ios is the best island in Greece if you ask me. I even prefer Ios over Ibiza which many people consider to be the best party island in the world. Most of those people has probably not been to Ios. I have been to both of these islands and I love Ios the most. 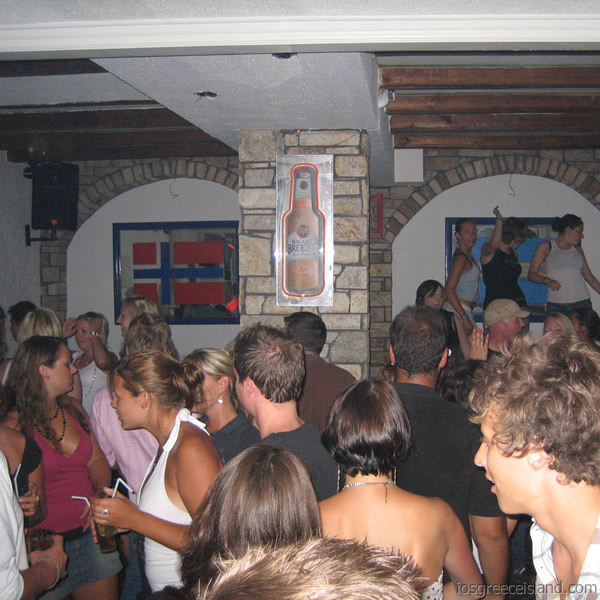 Read more bellow about the bars and nightclubs on Ios Greece. I share my views on which are the best clubs and bars on Ios so that you will have the best party holiday possible when you visit this Island in Greece. 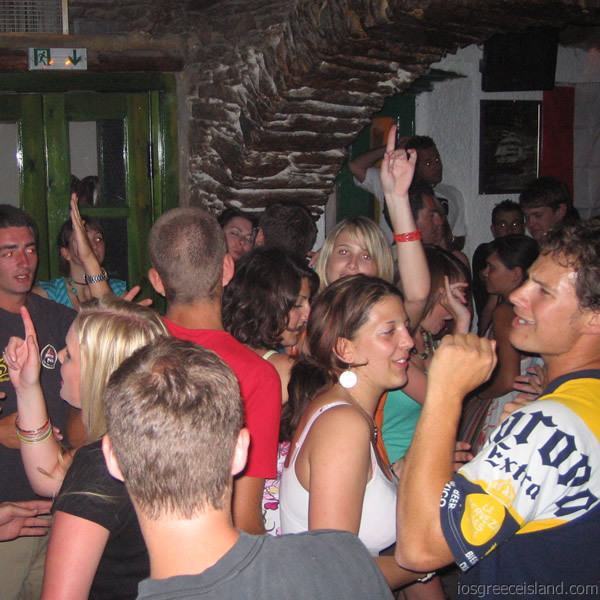 The Main Square of the village Chora is the center of the nightlife in Ios. Sit down and have a cocktail or mingle with the crowd. The square is not very big but it can still take some time to cross since it is always crowded with people during the summer months. The square is surrounded by some of the best bars of Ios such as Slammers, Shamrock, Ios Blue, Red Bull bar, Jonis Electric Rock Bar to mention a few. You also find the always popular Flames bar down the steps from the main square. My favorites among the bars around main square include Slammers, Shamrock and Ios Blue. I recommend that you try them out if you find yourself on Ios and interested in the nightlife. You may leave the Main Square in any direction and find many more bars and clubs. You will find Flames Bar, as mentioned before, down the stairs. Turn left at the end of this narrow street to come to Lemon Bar and more fun bars or right to visit the impressive Rehab Bar. Leaving the Main Square in the street exiting at Shamrock will take you to Shooters, Disco 69, Pegasus and many more bars and clubs. You find the bigger clubs on this main street, with the biggest one, Scorpion Club, located on the other end of the small village. 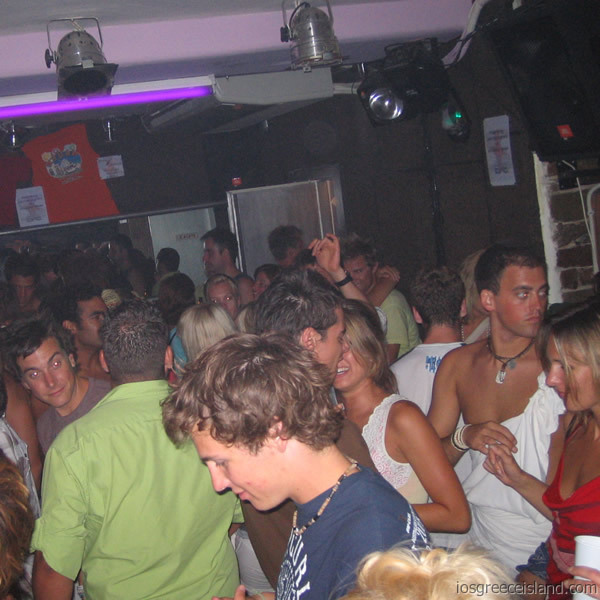 These clubs start to come to life when the smaller clubs and bars in the village start to empty in the early morning. Back to the Main Square and directions to leave. You will come to the Scandinavian Blue Note bar if you go down the street next to Red Bull bar and you will pass by numerous bars on the way there. The bars and clubs mentioned above are only a few of all the bars and nightclubs on Ios. You will find many more on your visit to Ios and probably find your own favorite among all the bars and clubs. Maybe you will party at Fun Pub or dance the afternoon away at Far Out Club on Mylopatas beach. Because the party on Ios is not only happening at night. You can start dancing in the afternoon and early evening at the beach. The Far Out Club is a popular place to dance and have fun right at the beach. The view is magnificent with the blue water in the background. So Ios Greece is the best party island in the world regardless of what time of day you like to party.